At times it was almost as if he had never been away. 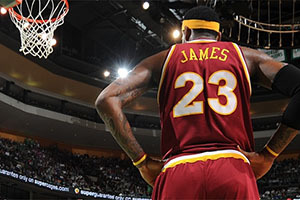 Okay, a more than decent showing in a pre-season friendly isn’t going to wipe out the hurt, the tears and the amount of burned merchandise but there is no doubt that the sight of LeBron James grabbing 12 points before taking a breather would have been a delight for Cavs fans. It was also an emotional night for David Blatt. Not only was it the first NBA exhibition game of his career, it came against the club he coached for six seasons. Blatt took Maccabi Tel Aviv to a number of Championships, including the thrilling victory over Real Madrid in Milan earlier on this year. Blatt left the European basketball environment to sample the very best of the NBA but in his first public outing with the Cavs he was taking on people and players who would have been more familiar to him than the team he was coaching. I was nervous before the game, but not because it was the first time I coached in the NBA. I was playing against my friends. He has a lot of ties to that team, a lot of ties to that community, that city, that country and his first real game is against his former team. So I don’t know how much he slept last night. It was a slow and steady introduction for James, who has been suffering a few problems with his back of late. He missed the practice session on Friday and then he decided that he would be better served sitting out the second half, a decision that was reached by sitting out the second half. It is important that the Cavs don’t solely rely on LeBron this season and it would have been pleasing for Cleveland fans to see some other players offer hope for a new campaign. Kyrie Irving was able to provide 16 points for the team and with 11 rebounds, Kevin Love definitely played his part in the win. The top players for the Israeli side were Sylvan Landesberg, who helped himself to 23 points and Jeremy Pargo, who notched 18 points. Before the game, there were a few protests outside the arena with a number of people objecting to the presence of an Israeli side. There will be plenty of sports fans that think politics and sport should be kept apart but it was inevitable that there would be a presence protesting the actions of Israel when an Israeli team was playing. 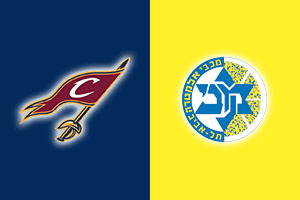 Not that the protest would have been a focus for Blatt or the Cavs, their eyes remain on the season opener against the New York Knicks which will be taking place on the 30th of October. It may seem like a good way away but it will be with us before we know it.